Authentic Gumbo recipe is a traditional southern soup or stew. 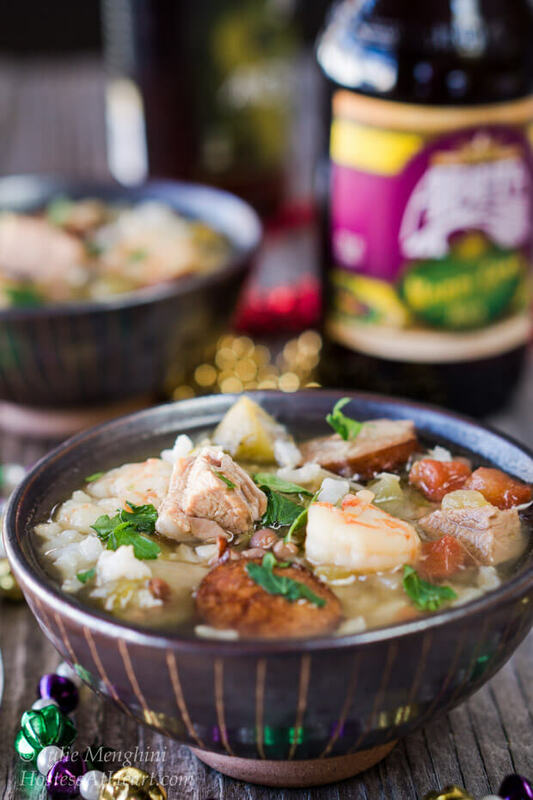 Shrimp, Duck, and Andouille Gumbo is a warm and delicioius way to celebrate Mardi Gras. 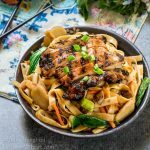 This delicious recipe was first published on 2/2/16 and has been updated to improve the reader experience. Americans love to celebrate anything. On St. Patrick’s Day we are all Irish. Same thing for Cinco De Mayo, and don’t forget events like The Kentucky Derby, and very importantly, Mardi Gras. 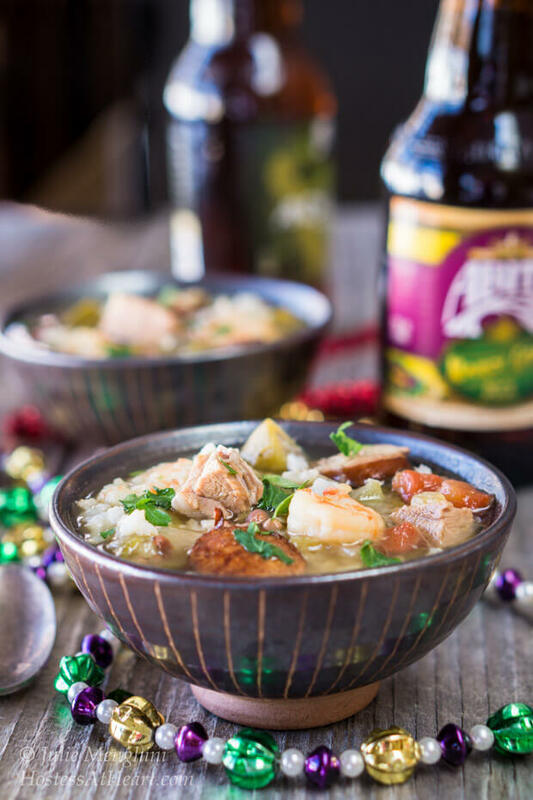 Mardi Gras isn’t Mardi Gras without this Duck and Sausage Gumbo. Add some friends, and you have all you need for a celebration. Mardi Gras, according to Mardi Gras, New Orleans, originated in medieval Europe in the 17th century, and France in the 18th century where it became the traditional revelry of “Boeuf Gras,” or fatted calf. On March 2, 1699, French-Canadian explorer Jean Baptiste Le Moyne Sieur de Bienville arrived at a plot of ground south of New Orleans, Louisiana. In 1703, the tiny settlement of Fort Louis de la Mobile celebrated America’s very first Mardi Gras. In 1875 the “Mardi Gras Act,” was passed making Fat Tuesday a legal holiday in Louisiana, which it still is today. John and I were in New Orleans, Louisiana in September one year. This isn’t during Mardi Gras of course, but we couldn’t believe the festive atmosphere. We decided that we wouldn’t have what it takes to survive in that city during Mardi Gras. The food is just amazing, and there is so much history. If you leave before trying beignets or chicory coffee, you haven’t experienced New Orleans. In true American fashion, I am celebrating Mardi Gras with a southern dish called Gumbo. There are as many Gumbo recipes as there are southern kitchens. I don’t use a lot of duck, but this duck gumbo is living large my friends! **Please note this is an easy Gumbo recipe but is cooked on one day and then reheated and served the next day so some of the fat can be removed. I wanted to try making Gumbo but I had a few questions before getting started. What ingredients are in an Authentic Gumbo recipe? File‘ (pronounced fee-lay) according to Spice House – Gumbo filé powder, a crucial ingredient in authentic Creole cooking, is made from the powdered leaves of the sassafras tree. When ground, they have a rich, sweet, cooling smell, reminiscent of eucalyptus crossed with juicy fruit gum. There is not a good substitution for the flavor. File’ also has thickening properties so if you’re not using file’ you’ll want to make a roux. What is okra and how is it cooked? Okra is a southern vegetable also known as “ladies fingers”. It is very nutritional and tastes similar to eggplant. Okra has a bad reputation for being “slimy”. However, there are methods for limiting the slimy texture. One Green Planet is an excellent source on how to choose Okra as well as using alternative cooking methods to what I’ve instructed in the recipe card below. Don’t forget to pin this recipe to your favorite board for easy reference! Gumbo File Powder – The perfect Gumbo spice and stew thickener. There isn’t a substitution for this spice when it comes to authentic gumbo flavor. Authentic Gumbo is a traditional southern soup or stew. 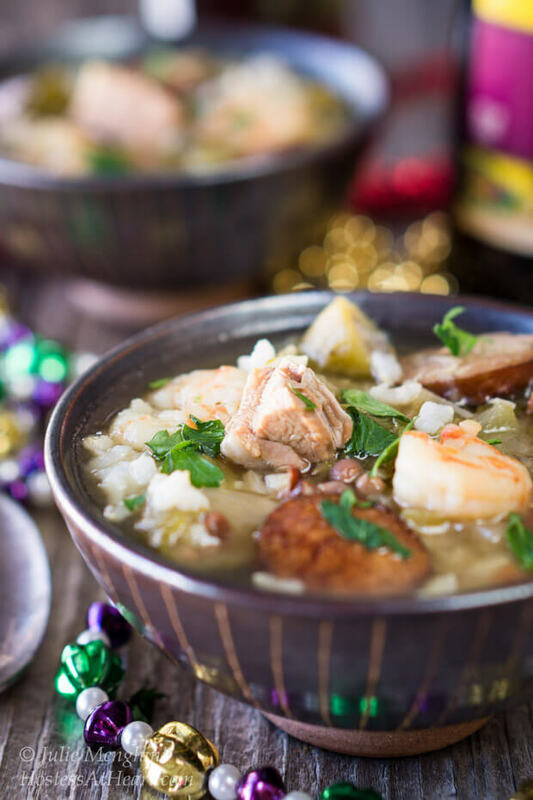 Gumbo ingredients such as Shrimp, Duck, and Andouille make a warm delicious Gumbo perfect for any Mardi Gras celebration! 1 cup uncooked rice cooked according to package directions. Roast duck or duck breasts, reserving fat. Allow to cool and dice into bite-sized pieces. Refrigerate until use. Add 2 tablespoons of duck fat to a dutch oven or saucepan. Add andouille sausage and brown. Remove the sausage with a slotted spoon to drain. Add 1/4 cup duck fat to the pan and 1/3 cup of flour to make a roux. Cook over low heat, whisking continuously, until it darkens to the color of peanut butter, approximately 30 minutes. Add additional fat or butter if necessary. Add onions, celery and green pepper and cook until softened. Add garlic and cook for an additional minute. While the roux cooks, in a separate skillet, add 2 tablespoons of duck fat. Add okra and vinegar. Cook over medium heat for 15 minutes. In a large stock pot or dutch oven, add chicken broth, water, spices, bay leaves and bring to a simmer. Add the vegetables, sausage, and duck. Simmer uncovered. until heated through. Remove from heat and allow to cool. Refrigerate overnight. Skim fat from the top and reheat. When hot, add shrimp and cook for 2 minutes or until shrimp turn pink. 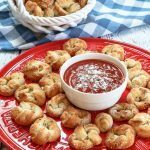 Here are a couple more recipes that would be perfect for Mardi Gras! This Gumbo needs a party so it’s best to share. Everyone has their own idea of Gumbo. What is yours? Leave me a comment and I’d love a 5-star rating! Thank you Loretta! I’m ready for Mardi Gras now! Thank you, Judi! If I’m eating donuts they’re going to be a good ole donut! No scrimping for me. I like duck on a limited basis. I grew up eating fowl and dark meat but have morphed into a white meat or chicken girl. This looks hearty & delicious. Thanks for sharing. Joy, the craziest thing just happened. I just clicked back into FF to catch up and saw your post and said I have to read this! 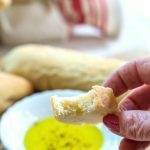 I pop back over to my blog and here you are! Thank you so much for stopping over. This gumbo was delicious and we really enjoyed it. This is so so delicious!! And those pictures Julie.. gorgeous! Thank you Swayam! Have a wonderful Valentines Day weekend! Interesting okra tip! I haven’t heard that before. I’ve gradually acquainted myself with okra, but only through frying it until crispy to bypass the slime. I’ll have to try using something acidic next. Thank you! I actually refrigerated it overnight so I could skim off the fat the next day, and there was literally non. The broth is very light. I’d never cooked okra before and was very happy to have that tip before jumping in. Thank you for stopping by and your sweet sweet comments! I hope you have a wonderful day! Thank you so much Jhuls! I love that you commented on my photos. They are always a work in progress! The soup looks so good, and I love your festive photos, Julie! Thank you Nancy! I think it’s a lot like other soups. Everyone tweaks it to make it their own. Thank you Petra! It was delicious and even with the rich meat it wasn’t fatty or too rich to eat. Thank you Sarah! Definitely good to warm your cold bones! I keep thinking I should try gumbo and your photos are making me even more tempted to get on to it soon- this looks amazingly delicious! Thank you Caroline! It took a bit to make but made a lot so still have my freezer stash! Thank you Julianna! It is perfect for Fiesta Friday, and thank you for hosting this week! Thank you Lily! So wonderful of you to host this weeks FF too! Thank you Ana! Yummy for sure! Lovely. I love gumbo and everything Creole/Cajun when it comes to food! Great photos! Thank you! This was my first gumbo and I was really pleased that it came out so good. Julie, this post is reminiscent of our time in the south. We lived in Texas and would frequent New Orleans whenever we had a chance. 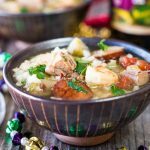 Your post screams Mardi Gras, love the colors, the styling and of course love gumbo! I’ve never tried cooking duck before, I keep saying I will. 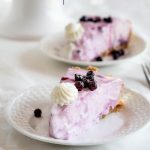 Such a great dish right in time for Mardi Gras! Thank you Loretta! This was my first gumbo and I enjoyed making it. We had friends over to help us eat it and it went over well. Julie this really sounds so good, it’s chock full of delicious ingredients. It really is a meal in a bowl. Love gumbo. Thank you Suzanne! It really was a complete meal in a bowl and adding cornbread really made it filling. I’ve never had duck before. You sure make it look wonderful!